Clinical Psychology is a very popular and competitive career path for psychology students. This practical and accessible guide contains all the information and advice required by those considering pursuing a career in the field. How to Become a Clinical Psychologist provides a clear overview of a career in clinical psychology, with chapters examining areas such as the educational and work experience requirements for selection; the doctoral training programmes and the personal qualities and attributes necessary for the profession. The training process is described and the wide range of career options post-qualification are outlined, supported with testimonials and first-hand accounts from clinical psychologists, current trainees and those aspiring to this career. Practical advice and examples are given throughout the guide and a wide range of real-life examples bring the realities of this challenging yet rewarding career to life. Written by established clinical psychologists who have extensive clinical experience in the NHS and in the selection and training of doctoral trainees, this book provides valuable information on the educational, vocational and personal requirements for the career. The perfect guide for anyone interested in clinical psychology, How to Become a Clinical Psychologist is an indispensable resource for A-Level students, undergraduates considering the discipline and anyone considering a career in this popular and fascinating profession. Chapter 2: What Does a Clinical Psychologist Do? 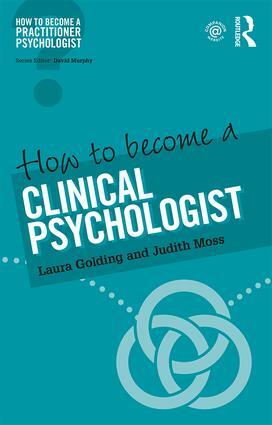 Chapter 4: Becoming a Trainee: How Do I Train to be a Clinical Psychologist? Laura Golding is Programme Director of the University of Liverpool’s Doctorate in Clinical Psychology programme. Much of her career has been spent working in the NHS with adults with learning disabilities as well as training clinical psychologists. Judith Moss works as a Consultant Clinical Psychologist in the NHS in Manchester’s Community Adult Learning Disability Service. She is also a Senior Clinical Tutor on the Doctorate in Clinical Psychology training programme at the University of Manchester.